With Vesta MPV system, offering integrated electrical connections, it is possible to connect different version of manifold valves. 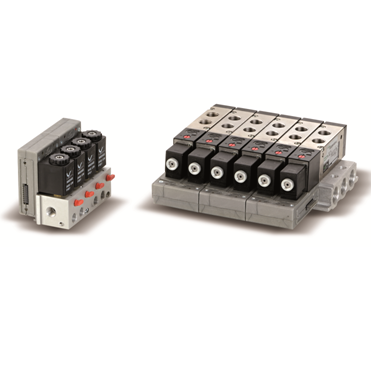 Connection modules are designed for 2 coil connections or for single odd coil connection and they are available in two different sizes; T1 and T2. The MPV system is available with solenoid valves K or JT 1/8 or 1/4 series in all versions 5/2, 5/3 and 2x3/2 functions.The Vesta MPV system is compact, versatile, easy to assemble anc can operate up to 24 solenoids, with 24V DC. or 24V AC. voltage solenoids aith led and varistore protections as standard.